Gandhi Research Foundation (GRF), was inaugurated by President of India, Pratibha Patil on 25th March, 2012. It is the promoter of ‘Gandhi Teerth’ which is sponsored by Jain Irrigation and Bhavarlal Kantabai Foundation. The Foundation is the initiator and promoter of ‘Gandhi Teerth′, an international centre for Gandhian study, research and dialogue. Its core objective is to preserve and promote for posterity the Gandhian ideology and legacy. 'Gandhi Teerth' comprises Gandhi museum, Gandhi International Research Institute, Gandhi archives, publications, and various programmes for rural development based on Gandhian lines. 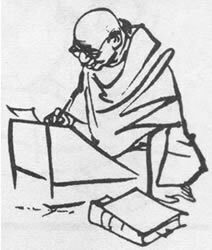 The foundation has a collection of 7350 books, 4090 periodicals, 4019 photographs, 75 films, 148 audio recordings of Mahatma Gandhi's speeches, and philately items from 114 countries. The Museum is located at Jalgaon, Maharashtra which is well connected by road and rail to the rest of India. The nearest domestic airport is Aurangabad (50 kms / 31 miles). Nearest international airport is Mumbai. Road distance between Mumbai and Jalgaon is approx. 415 kms / 257 miles.